On July 31, 1843, British Admiral Richard Thomas ended his compatriot Lord George Paulet’s six-month occupation of the nation of Hawai‘i and restored power to King Kamehameha III. Thomas made the declaration at what is now Thomas Square Park. To commemorate the event and the man behind it, the museum celebrates July 31, Lā Ho‘iho‘i Ea, or Restoration Day, with free admission for Hawai‘i residents (with ID) to the Honolulu Museum of Art and Spalding House. 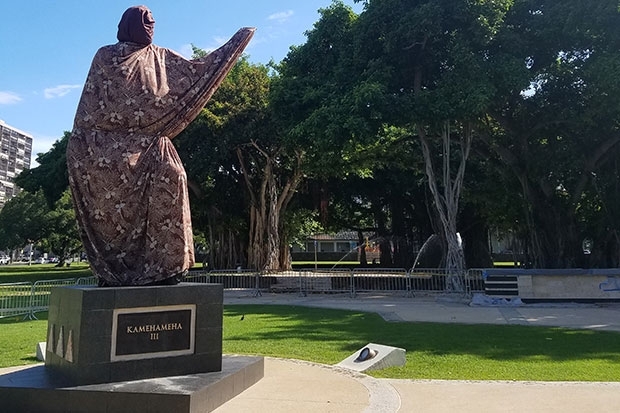 This year, on the 175th anniversary of the event, visitors can also catch a glimpse of the newly installed 12-foot bronze statue of Kamehameha III. The statue, crafted by Oregon-based sculptor Thomas Jay Warren, was commissioned by the Mayor’s Office of Culture and the Arts as part of an ongoing multimillion dollar renovation of Thomas Square Park. The last of the construction barriers that have surrounded Hawai’i’s oldest park for almost two years finally came down on Monday, revealing the new walkways, flagpole, and freshly-planted grass at the base of the covered statue which is scheduled to be unveiled Tuesday at 10am. Learn more about the statue and festivities on KHON2. Since the City of Honolulu spent $1.2 million dollars upgrading Thomas Square and the Commission on Culture and the Arts spent another $1.2 million dollars on enhancements & beautification why are we allowing the homeless to move back in?